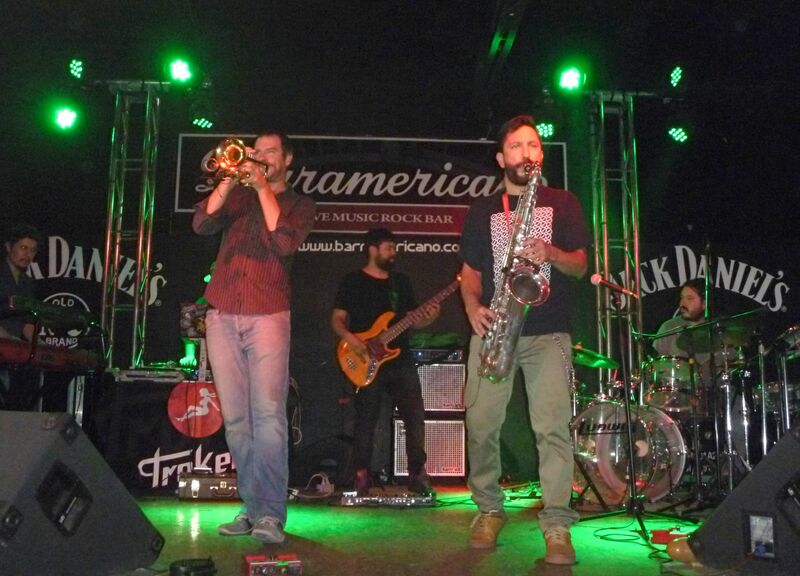 Troker performing at Guadalajara’s Barramericano last week. 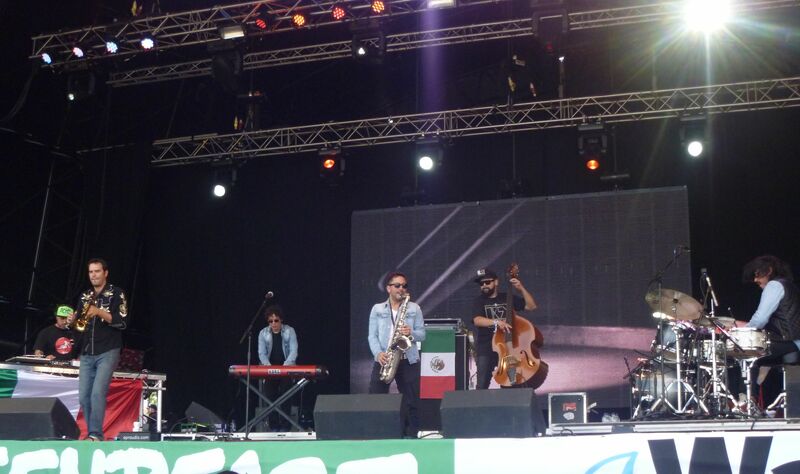 A year on from making their triumphant Glastonbury Festival debut, Mexican jazz fusion band Troker return to the United Kingdom this week to showcase their eclectic and infectious new album, Crimen Sonoro. A decade into their career, this six-piece band from Guadalajara have just enjoyed their most successful year to date, despite still refusing to sign a formal contract with any record label. After playing three gigs at Glastonbury last year they embarked on their first ever European tour and then went on to perform at SXSW in Austin, Texas in March. While many Latino bands are confined to success in Spanish-speaking countries, Troker’s heady mix of free jazz, rock, funk, hip-hop and mariachi music is entirely instrumental, meaning there is no language barrier for foreign audiences to overcome. With immediately infectious tunes and an energetic live show, Troker proved the perfect act for Glastonbury’s fourth biggest venue, the West Holts Stage, which typically hosts a diverse mix of hip-hop, jazz, reggae, dub, soul and world music artists. Such was the impact of their midday debut performance in 2013 that the West Holts promoters quickly broke protocol by inviting them to return for a second consecutive year. This time around the band will benefit from being given an hour-long, mid-afternoon set that will be broadcast by the BBC. They also have ten new tracks to draw on from their third full-length album, Crimen Sonoro, which the band describes as “our best work to date”. Before disembarking on their imminent “Tequila Groove” European tour – which will also see the band play in London, Bristol, France, Austria, Switzerland and Slovenia – Troker debuted some of their new material before a dozen or so journalists at Barramericano, a small live venue in Guadalajara. Spanish for “Sound Crime,” Crimen Sonoro embraces a harder, darker sound that its 2010 predecessor El Rey del Camino. This, the band and those around them feel, is the record that they have been working towards for 10 years. “Troker have achieved what they’ve always wanted: to sound like Troker. Now jazz, rock, funk, psychedelia and even kitsch are all living and partying together in a full, exotic mansion thanks to the magic of these six musicians,” says producer Gerry Rosado of the new record. On top of all those influences, the band said they even drew additional inspiration from dubstep after being exposed to the genre on their first visit to the UK. Troker made their Glastonbury Festival debut on the West Holts Stage in 2013. There has always been a strong visual element to Troker’s work and this album is effectively a soundtrack for a forthcoming graphic novel of the same name, with each song representing a different chapter. The key themes? “Love, heartbreak, murder and revenge,” Gonzalez said. “We’re really happy with the artwork, the production and the sound of the record,” he added. Anyone who saw the band during last year’s brief UK tour may recognise the lead single Principe Charro, which combines a hip-hop groove with screaming horns and wild mariachi flourishes. Other highlights include Femme Fatal – think a funked up version of a classic film noire score – and the sublime Arsenic Lips, which flirts openly with ’90s G-funk and retro ’80s synths that sound straight out of the Scarface soundtrack. Claroscuro is another treat, with its military drums and DJ Shadow-esque textures, while second single Tequila Death succeeds in distilling virtually all of Troker’s divergent influences into one spicy Mexican cocktail. After riding in on a muscular Queens of the Stone Age-like bassline, the track waltzes through fierce guitar licks, a stunning sax-versus-trumpet faceoff and some accomplished scratching by DJ Zero. At this point live performances see four sixths of the band take up the percussion, while the DJ and bass player lay down a heavy hip-hop instrumental. Crimen Sonoro is available now on iTunes, but to experience these tunes at their fullest it is well worth catching Troker at their best this summer: live on stage. For more information follow @TrokerOfficial or like Troker on Facebook. ← Infographic: How big is the drug trade?